Hey y’all! 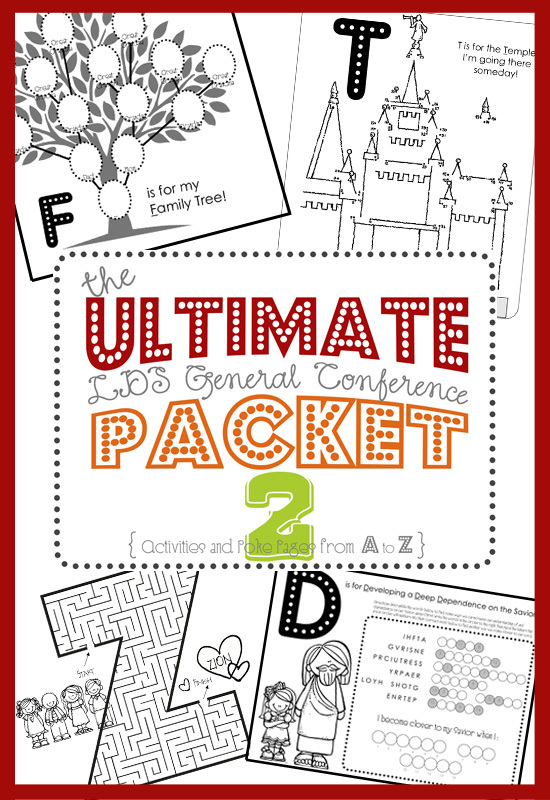 Just poppin’ in to share an ALL NEW Ultimate General Conference Activity Packet! I’m pretty sure I swore to myself after the first one that I would NEVER do this again. But it’s kinda like childbirth… after some time passes, you forget how painful the whole process was and decide to give it another go! HAHAHA! So here is my new little baby to share with y’all! (Isn’t she so cute?!) 😉 It’s loaded just like the first one with a whole whoppin’ 35 pages of activities to help keep the munchkins occupied, yet still aware of what’s going on during Conference! This packet is geared to the 5-12 year old age bracket, but could be used beyond that as well. Just be sure to get all the needed items (listed on the second page) gathered together prior to the start of Conference and you’re good to go. And for all those who are not of the LDS faith, I would invite y’all to join us as well! The messages shared are for the whole world, not just one specific religion. To watch online, just go to LDS.org and follow the links to watch, or you can just click HERE (when it’s time to watch). Have a GREAT Conference weekend y’all! And if you want to check out some of my previous Conference packets and activity ideas, you can see them in previous posts HERE. And, as always, best wishes in ALL your preparedness efforts! Yay!! This is amazing!!! We loved the last one! And can’t wait to print and use the next one. My boys love it. If you’re hestitant to make more, I’d love to help by way of offering to create some pages/activities to make the burden a little lighter. 🙂 (following your design and guidelines of course) thank you for this!! Jessica, that is such a super sweet offer! 🙂 I may take you up on that when I start feeling ‘baby hungry’ again. Lol! You are AMAZING!!! Thank you so much for sharing this!! I printed out the pages and made a binder for Brielle and am soo excited to let her use it for conference. You are my saving grace this year with feeling guilty of not having time to put something together myslef 🙂 Love you! Ooo… A binder is a good idea! I might have to do that too. 😉 love ya Jenna! THANK YOU THANK YOU THANK YOU.. I love this. You are amazing. I have so much respect for creative people like you. I know my class and nieces and nephews will love this. Thank you for sharing your talents with us. Thank you so much for this labor of love. You are truly amazing! I’ve been using your stuff for a few years now and I’m sorry it’s taken me until now to jump on and say thank-you. My goodness, what an incredible work of love you have shared with us! Thank you, thank you, thank you a thousand times more!! Simply wonderful, I will enjoy it as much as my kids, hehe. Thank you so much for sharing this. I’m so excited to use it with my kiddos this weekend. This is my favorite one! Thanks so much for doing this! This is probably the best packet I have seen for this age group. My kids will LOVE this!! Thank you so much for creating it….I am really grateful to people like you who take the time to do this and then let others benefit! Thank you so much! This activity booklet is one of the best I’ve found. I have high hopes of my kids being quiet while I try to take in as much as I can! You are amazing! Thanks so much for all your hard work! It is such a fun packet!! Thank you! Your volunteered time, effort, and creativity are such a blessing to anyone who has found your page! You have a heart of gold and may you receive blessings in return. Thank you SO much for going to all this effort! I know my 4 and 6 year olds will love this! Thank you SO much! We have used the first one several times and have loved it. We are so excited to get a new one!! Wow! This is absolutely incredible! Thank you so much! My kids will love this! Simply ingenious. I hope you can make your conference packets into an app. It’ll be so amazing!!! Thank you so much for this…this packet will be a lifesaver for me! Thank you for your two packets! I found them through beinglds.blogspot.com. I printed both out this morning and my boys loved them! It is awesome to have a quiet activity for them to work on while we all listen as a family to Conference. Thank you for your time and talents! this is so impressive! I printed off the first packet for conference and I’m saving this one for next year. My kids loved it, and I loved the variety of activities. Thank you! Oh, I found the packet to have plenty of activities for my family of four, so I just printed one set. Thanks again! These packets were perfect! Thank you so much!!! The kids will love these tomorrow. Thank you so much! Thank you for all your hard work. My kids are so excited to do these cute activities! Great activities, and it gives them a variety! Loved it, and we all could enjoy conference! Wow! Thank you so much for sharing your hard work with everyone. It will be used well! Just wanted to let you know that your link to the first packet is not working right. Looks like you left out the .wordpress part of the address. Thanks Diane. That probably happened when I switched my website to this new .wordpress location. I’ll go fix that. Thank You!!! Thank You!!! Thank you!!!! This is perfect! I so appreciate your efforts to bring it about!!! This looks fantastic!! We are going to try it out this week during Conference. Thank you so much for sharing! THANK YOU so much for this wonderful printout. Exactly what I needed to keep my little ones busy during conference. Thanks for sharing your talents with all of us! Thank you a thousand times! Finally a packet that keeps my kiddos engaged for, pretty much, the whole time. 🙂 They (5, 7, & 9yr) even said, “wow, I love this packet mom!” I SO appreciate all the time you put into making this, & for sharing w/ us! Bless you!!!! This is amazing! Thank you for sharing. Blessings for you for making this wonderful Gen Conf packet! My daughter is thrilled. Thank you again and again! Thank you so much for all of your hard work. My family loves these packets! They love them so much, I can use them for multiple conferences. This is beyond amazing. You will be something I am grateful for in my prayers tonight. Thank you so much for offering such an amazing packet. I hope you get many blessings for your service! Wow! This is an amazing packet! Thank you so much for all the time and effort you put into this. Much appreciated! We have loved using these each year! Thank you so much! Any chance you are going to be updating this!?! Hi Sarah! I’m so glad you’ve been enjoying the packets! 🙂 I’m likely not going to have a chance to update them before this upcoming General Conference. 😦 Sorry about that. But I do anticipate getting them updated for October when we will also have two new Apostles called. THank you SOOOOO MUCH FOR DOING THIS!!! My children have looked forward to General Conference more than ever before! Do you have plans to make a Number 3?! I would seriously LOVE IT and I’m willing to help you gather ideas for it! I just don’t know how to make it look all cute like you do! 🙂 Let me know!